4.1.5 Articles from Magazines. e.g. 4.1.7 Internet or On-Line References. e.g. Ibrahim Hayatu Kubkomawa was born on 18th April 1975 at Kwargashe Village of Lala District, Gombi Local Government Area of Adamawa State, Nigeria. He is a devoted Christian and Lala by tribe. He attended Fotta Primary School from 1983 to 1989; General Murtala Mohammed College (G.M.M.C) Yola, from 1989 to 1994. He proceeded to the Federal University of Technology Yola, (FUTY) now Modibo Adama University of Technology (MAUTECH) Yola where he obtained B. Tech. (Hons) Animal Science and Range Management with Second Class Upper Division in 2002. He was deployed for his National Youth Service Corps (NYSC) to Alu Community High School, Alu, Kogi State. During his service year, he distinguished himself and served selflessly and meritoriously, which earned him a state NYSC award of commendation as a dedicated and committed corps member of 2002. He holds a Certificate in Computer Application and Techniques with WISEMATE Nig. Ltd., Ikoyi Lagos in 2006; Certificate in Computer Appreciation and Applications with Impact and Associates (Management Consultants) Maiduguri, Borno State in Collaboration with Skisoft Systems Consultants Ltd., 2009. He also holds a Master’s Degree in Animal Production and Management from Federal University of Technology Yola in 2011. He is also a Ph.D student with the Department of Animal Science and Technology, Federal University of Technology, P. M. B. 1526, Owerri, Imo State, Nigeria. He is a Registered Animal Scientist (RAS), a full member of the Nigerian Institute of Animal Science (NIAS) and Animal Science Association of Nigeria (ASAN). He has thirty one (31) published articles in reputable local and international journals across the world. He has also attended many workshops and conferences of international renown. He has taught in Adamawa State College of Agriculture, Mubi between 2003 and 2007 and is currently a Lecturer with the Department of Animal Health and Production Technology, The Federal Polytechnic, P. M. B. 35, Mubi, Adamawa State, Nigeria. The author’s hobbies include: reading, writing, traveling, listening to gospel music, meeting and helping people. His likes include: appreciating beauty of nature, honesty, hard work and respect for people. 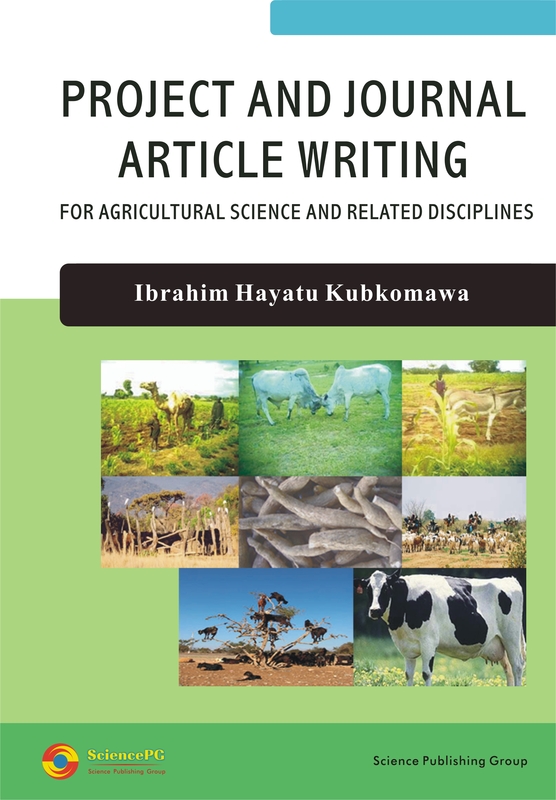 This Book, Project and Journal Article Writing for Agricultural Science and Related Disciplines, is a guide. It is a product of positive, visionary and innovative thinking conceived and nurtured over the years out of observing lots of confusion, difficulties and frustrations confronting ever anxious, desperate young graduating students and researchers. This led to its designing and compilation to help and guide final year students, researchers and all stake holders in the field of agricultural science and other related disciplines. Graduating students may embark on self-reliant research project work from start to its logical conclusion without much problem using this guide. It critically identifies and treats the most important and demanding basics, fundamental ground rules, and essential items required for any meaningful scientific research work. Research and journal article writing is one of the pre-requisites to attain the peak of the profession in an academic community. When you fail to publish you perish and lots of beneficial ideals and knowledge perish with you. To students, it’s poignant to point out that they should learn to conduct and write a fairly good research project and graduate with flying colours or ignore the tactics, rudiments, nitty-gritty and be frustrated within the academic environment. It is the author’s sincere desire; hope and faithful prayer that, whoever reads this book with great zeal and comprehension, will find it up to date, promising and fulfilling to answer the many research questions that they were unable to answer before.